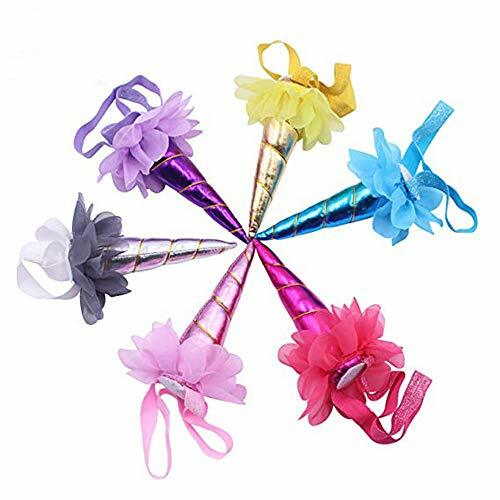 6 Pack Unicorn Headband Shiny Unicorn Horn Glitter Elastic Headband Dress Horn Party Flower Headband Unicorn Cosplay Costume Children Party Supplies by Blosion at Animal Backgrounds. MPN: 43234-2455. Hurry! Limited time offer. Offer valid only while supplies last. PACKAGE:6 x adorable unicorn party headbands. One in blue, one in purple, one in yellow, one in silver, one in rose red and one in pink. HORN SIZE: it stands about 5.5 inch tall, soft and beautifully colored, comfortable for baby kids. Many colors available, adorable to match your baby. ELASTIC BAND: the headband girth is about 17 inch. With good elastic, it is suitable for most heads, from children to adult. MATERIAL: a stunning shiny unicorn horn, which is made of a super shiny polyester fabric that looks like unicorn horn, and the material will do no harm to your skin, also safe to babies. APPLICATION: good for baby shower, birthday party, family photo, cosplay party, performance, festivals, carnivals, costume party, fancy ball, classroom party and any other occasions you like. If you have any questions about this product by Blosion, contact us by completing and submitting the form below. If you are looking for a specif part number, please include it with your message.